Measurements: 3.15 x 4.75 inches; or 80 x 120 millimeters. Back of card: Solid orange. There is some two word Chinese phrase repeated 35 times in white in a pleasing pattern. Looked in the book for a translation but found none - would appreciate if anyone knows. 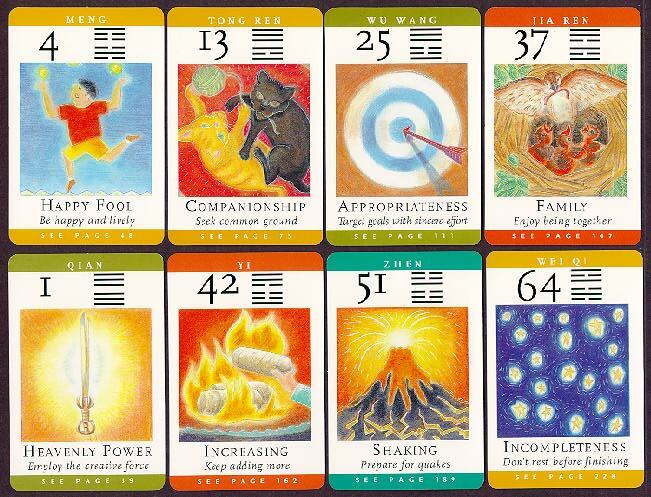 I-Ching has no concept of inversion (an inverted card becomes another trigram), but that won't stop clever people from reading these cards inverted anyway. Book included: Yes, 231 pages, 7.1 x 4.75 inches, or 180 x 121 mm. Written by the two authors above. Publisher: Tengu Books. Printed in Hong Kong. Comments: Despite the name, NOT a tarot deck. There are no major arkana, no minor arkana, no suits. In the book, the author explains that as fortune telling decks are all called "tarot" in the west, he thought he should call his deck a tarot, too. The book covers each of the 64 hexagrams, as well as the eight basic trigrams that underlie them. In addition, cards can be further clarified by tossing three coins. So in addition to text for 64 oracles, there is also text for 384 variants. An excellent introduction to the I Ching.